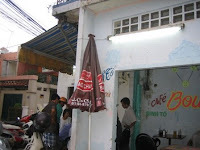 Now everyone knows that, come early evening, every second building in Saigon is transformed into a restaurant or coffee shop. What was a grimy motorcycle shop by day is by 6pm serving up steaming hot bowls of rice noodles, or mung bean sweet-soup, or steamed buns filled with fish mince. One need never go hungry in this city, though perhaps after the occasional bad choice one might wish one had. A quick stroll down the street at dusk offers up any number of delicacies. 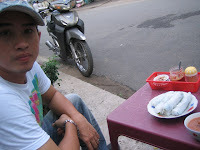 We went to have banh cuon, but a regional variation that I'd never encountered before. The thick rice noodle is wreapped cold around some lettuce and a delicious slice of barbecued pork, dipped in hoisin sauce mixed with ginger, garlic and chilli. Absolutely delicious, though not enough - I had to top it off with a bowl of bun nem nuong - cold noodles served with a range of barbecued meats and, in this case, a cut up spring roll. Delicious too. The restaurant is closed during the day, but at night it also serves as a venue for playing a chinese card game that I find impossible to understand, but which is much loved in this city. Such ad-hoc restaurants employ legions of country cousins and poor farm boys from the North. These kids are payed poorly, but their good humour and cheer are an absolute lesson in strength and resolution in the face of often quite desperate circumstances. I wish them all the best, and I hope you do too. 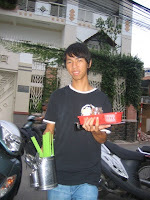 Keep the poor waiters of Vietnam in mind when next you pray.